I painted this view this morning a couple of steps from my tent while camping in the Hells Canyon Recreation Area. The elevation is about 6600 feet or so according to the Forest Service topo map. It was a lovely view to contemplate while drinking my morning coffee. The wind was howling most of the night on top of this ridge (Summit Ridge), but it was fairly calm this morning. 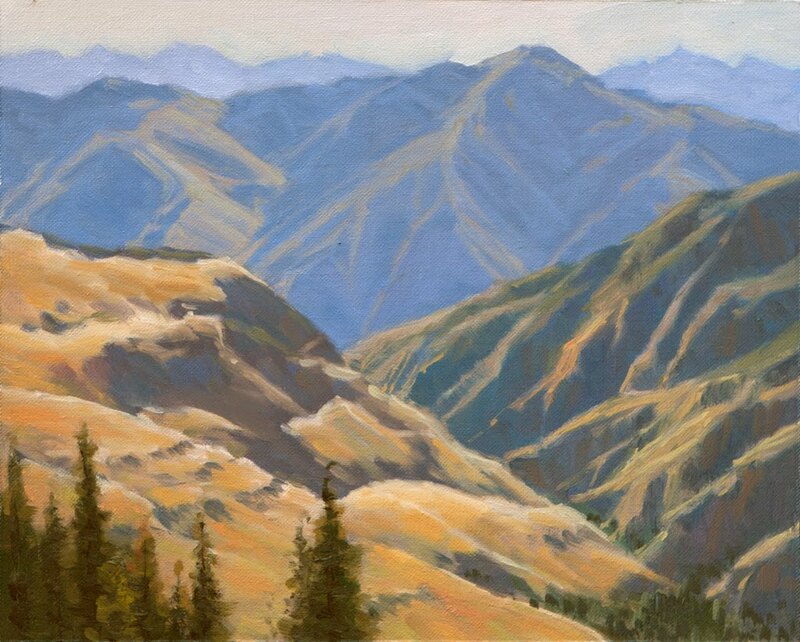 This view is looking east into Hells Canyon; in the first draw runs Saddle Creek while the Snake River is down there somewhere in the main canyon area. The mountains in the distance are the Seven Devils in Idaho. Makes me wish I had a trail horse and a pack mule to explore the area. Study 10x8", Oil on Linen. I love the softness of the yellows in the near hills. A trail horse is exactly what comes to mind; that and a memory of scenes from Ang Lee's film.